Research published ten years ago confirmed the existence of close similarities between the human genetic structure and that of Bonobo monkeys. Many differences exist between the two species, but a pure statistical comparison reveals a 98% commonality in DNA sequences. Ongoing experiments in the United States of America have shown the Bonobos' capacity to memorize words and use primitive tools. Tests show that, with sustained training, these animals can equal the linguistic abilities of a two-year-old human child. Interesting as this research may be, the question is whether we can learn something from Bonobo monkeys. Ape enthusiasts have pointed out how peaceful these animals are, but facts contradict this conclusion: Bonobos are known to behave violently on some occasions. Their society cannot be portrayed as free of aggression. Those who promote vegetarianism amongst humans by pointing at the Bonobos' diet also lack scientific evidence. Observation in their natural habitat has shown these apes eating not only fruit, but also smaller animals such as flying squirrels. Are there any characteristics of Bonobo monkeys worth reflecting upon? Human beings possess infinitely more intelligence than apes, but are we necessarily happier? If our thinking impairs our primitive instincts, does this always happen to our advantage? Naturalists are making great efforts to save Bonobos from extinction. At the time of this writing, only a few thousand of these apes continue to live in their natural habitat in Central Africa. Hunting by man and deforestation, which diminishes their food supply, represent the greatest threats to their survival. From what we know about Bonobo monkeys, four elements catch our attention: they possess modest skills to allocate resources, some marks of individuality, a tendency to avoid unnecessary effort, and a limited ability to adopt self-protection measures. Let us review these four ideas in detail. Efficient use of resources: Bonobo monkeys, like all animals, do not move always at the same speed. What makes these apes remarkable is that they are able to walk upright on two feet for extended distances. Scientists estimate that Bonobo monkeys walk approximately one fourth of the time in upright posture. We do not know yet what makes them walk sometimes upright and otherwise on all fours. The logical conclusion might be that, to a certain extent, Bonobos are able to allocate their physical resources to match the situation. Similarly, observers in Central Africa have noted how Bonobo monkeys split in groups to look for food more efficiently. The drive to optimize resource allocation, which is intense in human beings, seems to be a characteristic that we share with Bonobos. Marks of individuality: The facial features of each Bonobo are highly differentiated, as it is the case in humans. Each monkey is unique and can be distinguished from other members of the species. On the other hand, research fails to show evidence of personality in apes to an extent that could be compared with complex human traits. 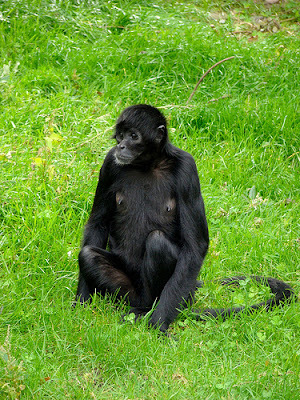 The individuality of Bonobos is linked to their particular family and group. Incestuous relationships do not take place and intruders from other groups are rejected. For humans, our uniqueness encompasses psychological aspects, convictions, and personal interests. In both cases, human and ape, attempts to ignore individual traits generate distress. Abhorrence of waste: Bonobos eat mostly plants and fruits available in the area they inhabit in Central Africa. Hunting, which demands much more effort than foraging, plays an exceptional role. When these apes go after smaller animals, they focus on preys that can be easily caught and quickly eaten up. Bonobo monkeys hunt above all flying squirrels and small forest antelopes. Preys are eaten up immediately after caught. Such violent behaviour is relatively uncommon for these apes, since they can obtain proteins more easily by eating haumania, a plant that grows in Central Africa. In humans, the tendency to spare unnecessary effort seems to be linked to individual motivation. Long-term productivity gains demand levels of thoughtfulness, patience, and personal involvement that not every person is willing to contribute. However, the general inclination to avoid waste is present in all men. Protection against threats: Bonobo monkeys build nests in trees where they retire to sleep at night. In their natural environment in Central Africa, this protective measure proves highly effective against predators. In addition, Bonobos protect their territory against intruders from other groups. These apes tend to react to problems by acquiring stable habits that consolidate improvements. Experiments in the United States aimed at teaching Bonobos to recognize words show that their learning takes place in stages. After they memorize a series of sounds or signs, the knowledge is consolidated before further symbols can be taught. Human beings learn in a similar way, for instance foreign languages, although at an incalculably higher speed. Bonobo monkeys share the above four characteristics with humans, but their performance is lower in all areas. Improvements in Bonobos' cognitive skills take place only in controlled experiments. Left on their own, these apes show little ability to develop or acquire new knowledge. What we can learn from Bonobo monkeys is that their desire to profit from the environment with minimum effort seems to be innate. Bonobos possess marks of individuality, try to avoid unnecessary labour and are able, to a modest extent, to adopt self-protection measures. Like humans, these apes react to problems by searching solutions that provide increasingly higher levels of stability. The inclination towards increasing efficiency is present in Bonobos only to the extent of their limited intellect. In man, who is endowed with endless capabilities for improvement, this tendency is irrepressible.